Anybody who served in or around the Florida Legislature while Rep. Gayle Harrell represented Stuart and Port St. Lucie knows Gayle’s husband, James. For 16 years, eight elected terms, ever since poor health ended his Ob-Gyn Stuart practice, Dr. James Edward Harrell was there for the wife he adored. There’s no other way to put it. Selflessly, faithfully, tirelessly there. Dr. James Harrell -- patriot, community activist, one of Stuart’s first doctors -- died on Friday, May 11, suspending in time a real-life love story few people get to see at a distance, let alone experience. He was 79. By all means, read the beautiful obituary his family wrote about the man whose life was changed after he saved two drowning children, the man who fought against domestic abuse and delivered 4,000 babies before his career was done. James Harrell was a true local hero in a small community that needed as many as it could get during its developing years. He was one of my heroes during those times -- I always called them our "awkward years" -- because he lived right. He believed in the good in people, he believed in giving back and he led by example. "I remember, if we needed a volunteer for something, it was always Jim," said Joan Jefferson, mayor of Stuart 25 years ago. "He was a soldier in anybody's army for a good community. Just a wonderful public servant, even though he had his hands full with his medical practice." But you can't talk about James Harrell without talking about Gayle. You just can’t. Gayle was his college sweetheart. She didn’t just raise their four children, she was a real partner in his medical practice. She was there for him. Selflessly, faithfully, tirelessly there. It’s all true, what the obituary says. I remember it. Dr. Harrell opened a clinic in Indiantown -- maybe not singlehanded, but that's how it plays in my memory -- mainly to offer prenatal care to the one cluster of patients in Martin County who truly couldn’t afford it. And he was pretty much a miracle worker out there as I remember it, largely because of Gayle, who managed his office and then some. Gayle speaks Spanish and used it to translate for patients who couldn't speak English. When patients couldn’t pay with money, the Harrells accepted “anything from a bag of oranges to fish caught in the St. Lucie River.” It wasn't James who made the decision to be that kind of good-citizen doctor’s practice. And it wasn't Gayle either. They made the decision together. When James got back from Vietnam, exposed as he was to Agent Orange, he had already contracted juvenile diabetes – or, Type 1. Neither he nor Gayle ever complained. They accepted their lot and dealt with it. But over the years the diabetes drove his body downhill and developed other medical problems. 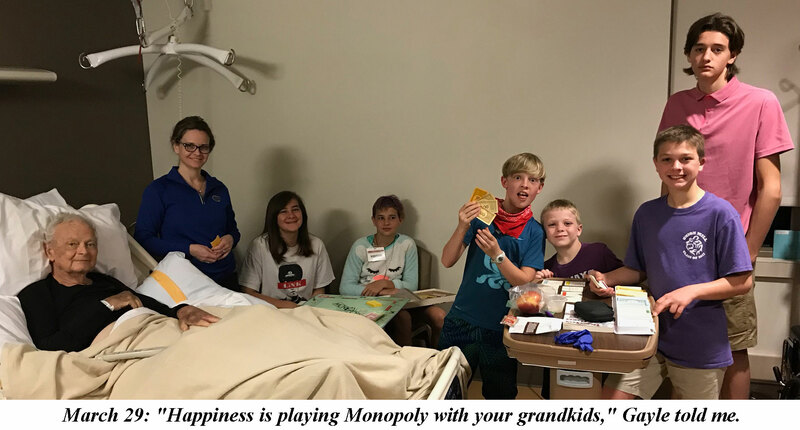 His kidneys failed in 2000 and in 2002 a medical professional, a friend, offered her perfect-match kidney for transplant and bought James another 16 years of life -- enough time to see his four children grow up and the birth of his eight grandchildren. Between home and office and a loving partnership, Gayle developed the skills and discipline to take care of James’ medical needs, too. So, in the end, during the last three months of James’ life, she somehow had equipped herself to be his surrogate nurse and patient advocate, and still finish off an accomplished career in the Florida House. Over Easter, she texted me that she was looking for rehab centers that would also drive James to his dialysis appointments. As the legislative session was winding down, Gayle called her four children to take turns staying with their father while she finished up. She spent every waking minute away when from Tallahassee at his side, in Shands, preparing for the day he could be moved home. Anne MacMillan, one of the first investors in downtown Stuart redevelopment, was a University of Florida classmate of James and Gayle and was at the house with the family the night before James died. “Gayle and I were both dating medical interns and we both married them," she recalled. "I don’t think we would have come to Stuart if it weren’t for Jimmy – I always called him by his college nickname ‘Weasel,’" she said. "Jimmy finished his internship ahead of David (MacMillan), so when David was ready, Jimmy came up and got him and said ‘Stuart needs a neurosurgeon,’” she said. “Jimmy was funny and smart and warm and patriotic. Just good people … boy, I miss him already,” she told me in a telephone interview an hour before Monday’s Celebration of Life service. I sent Gayle a text Friday, the day James died, the day that also would have been my husband and my 44th wedding anniversary and the first one without him, to tell her how sorry I was to hear about James. “This is the worst time of my life,” Gayle told me Friday. “I loved him so. … He was the wind beneath my wings. Not many people go back as far as friends as (James) “Der Weasel” and I do , to and including Hendricks Avenue ( school boy patrol . James was one of my lieutenants as was another fellow who later became a cardio vascular surgeon and served in Vietnam also )”Landon, Life Saving Corps, University of Florida, K A and post graduate to and froings . I also knew and know all of James’s siblings , ie , Martin, John, Mary Jane and William whom I see most frequently as he goes to my church and belongs a club I do. I was happy to see James at our 69th high school reunion in 2916 .Rest in peace my good friend. From the moment I met Dr.
From the moment I met Dr. Harrell, I knew he was inspirational. May he rest in peace. Beautiful column about a beautiful man and an amazing love story. Thank you! He was a beautiful man in all ways--husband, father, grandfather and patriot. You perfectly captured his spirit. So sorry to hear about James .He was a special man. He will really be missed.Is there any way l can see his obit? Great Article! Dr.Harrell and his Wife and family are a great example of true family and love. You will be missed! What a great tribute to Dr.
What a great tribute to Dr. Harrell, Nancy...you captured his spirit...he was a TRUE Southern gentleman...always polite, friendly and yes, supportive of Rep. Harrell...and he was ALWAYS there...wherever she was, he was there with her...so sad to hear of her loss...they were a SUPER couple...thanks for the memories! Dr. Harrell was a wonderful man; so genuine and loving toward all human beings. I was lucky to have known him and he will be sorely missed in our community.